One of the things everyone should know about when deciding on getting a new pug include dog genetics which may be indicative of the health issues specific to the breed of pet they’re considering buying. Pugs, like most other breeds, have their share of breed specific health issues, and this blog post, though not complete, should serve as a primer to understanding what those more common issues are. This particular condition affects the legs and can impair your dog’s mobility. This is sometimes referred to as “trick knees” by owners and medical practitioners alike and the ailment is common in pugs. The sum of it all is that luxating patella involves the dislocation of the small bone in the knee called the patella from the femur. This is where the patella is normally held in place by ligaments around that bone. Sadly, as it pertains to dog genetics, this type of problem is something to be aware of and a minority of pugs will be affected by the condition. In less severe cases, the dislocated patella can sometimes fall back into its original position however in severe cases, the patella will move from its normal position frequently and even after correction. The most drastic of these cases require surgical correction to ease and relieve pain but also to prevent the eventual onset of painful and debilitating arthritic conditions that typically associate with luxating patella. The corrective surgery is a delicate procedure and can be expensive. With that being said, many veterinarians will speak freely about how frequently successful the procedure can be. 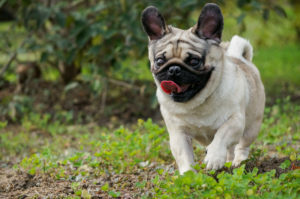 A pug may run in a bunny hop style, lifting both legs up at the same time, and jetting them outward. Also notable and within the control of most pet owners, while luxating patella is a genetic issue, it can also be brought on by obesity or even just some excess weight. As pugs are typically pretty relentless eaters and thus weight problems can be easily sought after, this condition is often triggered by weight alone in overweight pugs. While this is a general note about a generally more common health issue among pugs, many can and do live their entire lives without coming across the condition and even some that do come down with it live on pain free. If you suspect any issue with your dog, get off the Internet and consult with a veterinarian asap! In summary progressive retinal atrophy is the degeneration of the vessels that are around the retina of the eye. This condition usually begins with the development of night blindness in younger dogs and over time their vision degrades and deteriorates progressively. Ultimately, this leads to blindness. Luckily, just because your pug may become blind… as tragic as that is, your little buddy still has a very strong sense of smell and can give and receive love as though it were day 1. This is the deposit of pigment on the white surface of the eyes. Pigmentary keratitis is basically the result of various factors that either irritate or inflame the cornea over a period of time. If that factor which is causing the inflammation or irritation can be identified, it can usually be corrected with a relative quick but sensitive surgical procedure. Common in short muzzled breeds, ESP is the obstruction of the dogs’ airways. The standard snoring of a Pug is a degree of ESP in action, though more severe cases can be heard through sounds such as honking, gasping for air and the blocking of the dogs’ vocal box. ESP can be corrected through surgery. Is a birth defect found in breeds with short noses including the Pug and is essentially overly soft nasal tissue. When a dog with overly soft nasal tissues breathes, their nostrils collapse, leaving them to breathe through their mouths to get the necessary oxygen. You can identify a dog with SN by noting a foamy discharge when they breathe or excessive breathing through their mouths when they get excited. SN can be corrected through surgery. Commonly called PDE, Pug Dog Encephalitis is as the name implies, unique to Pugs. Little, if anything is known of the causes of PDE, which is essentially an inflammation of the brain. PDE tends to affect young to middle aged Pugs and feature seizure as it’s primary symptom. Lethargy or listlessness and loss of muscle coordination can precede the seizures. Accompanying seizures are several symptoms ranging from aggression to pacing in circles to pressing their heads against objects such as walls and people. PDE appears to come in two varieties: Slow Progressive and Rapidly Progressing. The Slow Progressive form features seizures that recur in a matter of days, or weeks, where the Pug will, after the seizures, return to normal. Rapidly Progressing PDE features seizures, often more frequently, and disorientation in between seizures. While Phenobarbital can be used to control the seizures, and Corticosteroids can reduce inflammation, there is no cure for PDE and the result is generally the same as PDE progresses. It is important to note however that seizures are not necessarily a sign that your Pug has PDE. Pugs can, like many dogs, have epileptic seizures that can be treated with Phenobarbital and have absolutely nothing to do with PDE.